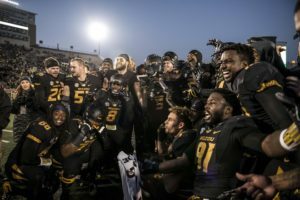 Mizzou overcame its largest halftime deficit in a win in school history, scoring 21 unanswered points to register a 28-24 victory over Arkansas in the Battle Line Rivalry, presented by Shelter Insurance. The win keeps the Tigers (4-8, 2-6 SEC) undefeated against the Razorbacks at Faurot Field since resuming the series between the schools in 2014. The win is eclipsed only by the 21-point comeback vs. South Carolina in the 2005 Independence Bowl; with the Tigers only down 14 at the half of that game, today’s is the largest comeback from a second-half deficit for the win. Credit goes all around: Among others, freshman Drew Lock (Lee’s Summit, Mo.) threw for 212 of his 268 yards and a touchdown in the second half; junior J’Mon Moore (Missouri City, Texas) became the first 1,000-yard receiver since Bud Sasser in 2014; junior Nate Strong (East St. Louis, Ill.) had a pair of scores, including the game-winner with 12:48 left; and junior DE Marcell Frazier (Portland, Ore.) notched three sacks and four total tackles for loss. Arkansas (7-5, 3-5) struck first on its opening drive, getting a 66-yard pass on the game’s opening play down to the Mizzou one-yard line. RB Rawleigh Williams III then punched it in from one yard out to give the Razorbacks a 7-0 lead not even a minute into the game. Mizzou countered thanks to the big play ability of WR Johnathon Johnson (Memphis, Tenn.) set up Mizzou’s first score of the game. He took an end-around rush 81 yards for Mizzou’s third play of 80+ yards this season, tying for third in the nation. That set up a score after Ish Witter (Tampa, Fla.) carried for seven yards before fumbling at the goal line, but Moore picked up the fumble in the endzone for a score. The Razorbacks countered with a 30-yard TD run by Devwah Whaley, capping an 11-play drive that spanned 76 yards and 5:22 of clock time, reopening an Arkansas lead at 14-7. Arkansas converted a third-and-11 early in the drive and a fourth-and-one just two plays before the TD run. The lead grew to 21-7 following another long Arkansas drive that spanned 91 yards over 16 plays, taking nine minutes of clock away with 8:05 remaining in the second quarter. The Hogs added a field goal with 1:08 to play in the half as Frazier blew up a third-and-two to stall the drive, but it still resulted in points for Arkansas which led 24-7 heading into the break. Arkansas missed a 48-yard field goal as time expired in the opening half. After deferring on the coin toss, Mizzou got the ball to start the second half and went 63 yards on nine plays, capped by a two-yard TD run by Strong to cut the lead to 24-14. The key play on the drive was a 48-yard catch by Moore on third-and-11 to extend the drive deep into Arkansas territory. He also hauled in an 18-yard pass on third-and-15 later in the drive to keep it alive. On Arkansas’ ensuing drive, Mizzou seemed to stall the drive with Frazier’s second sack of the day, setting up a third-and-16, but Arkansas converted it and moved deep into Mizzou territory. But senior CB Aarion Penton (St. Louis, Mo.) used a blitz to disrupt and third-and-goal from the two and Arkansas QB Austin Allen threw an interception to Mizzou’s Cale Garrett (Kearney, Mo. ), the first of his career. It was Mizzou’s 14th pick of the year, the most for a Mizzou team since 2013. Mizzou appeared to stall out after three plays on the ensuing possession, but Barry Odom dialed up a fake punt from the shadows of his own goal posts and Anthony Sherrils (Kansas City, Mo.) took a direct snap to pick up the first down. Two plays later, Lock found Johnson for a 67-yard TD strike as Mizzou cut the lead to 24-21 with 2:07 remaining. Mizzou again got another great third-down conversion, this time from Moore on a 49-yard grab in third-and-five. That set up Strong’s second TD of the game as Mizzou gained its first lead of the day at 28-24 with 12:48 remaining in the game.